In a small bowl, combine 3 minced garlic cloves and 2 tablespoons olive oil and let stand 30 minutes. Preheat oven to 500 degrees. Prepare vinaigrette. In a large bowl, whisk together the remaining 1/4 cup olive oil, lemon juice, remaining minced garlic clove and salt and pepper to taste. Set aside. Take each pizza crust and brush with garlic-infused oil. Spread cheese equally among crusts to within 1/2 inch of the edge. Bake cheese topped pizza crusts until golden and crisp, about 8-10 minutes. In the meantime, toss the arugula and tomatoes with the vinaigrette. 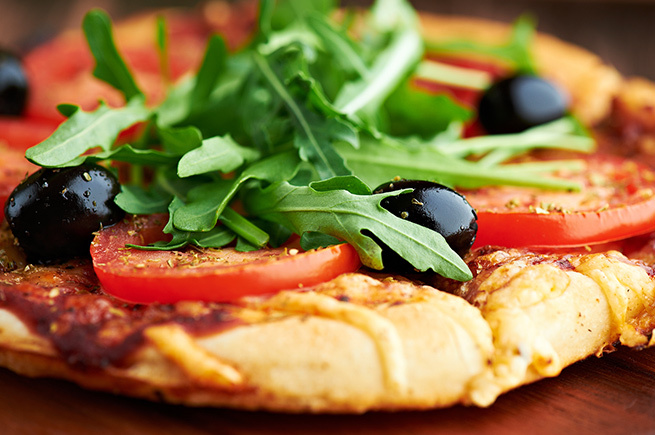 Remove the pizza from the oven and top with the arugula and tomato salad, distributing it evenly. Cut and serve immediately.